The architect responded with a design which embodies the concept of a village clustered around a town square – the traditional meeting place of a community. Rather than a literal imitation of a small town, the concept is suggested by the choice of materials and the spatial organization. 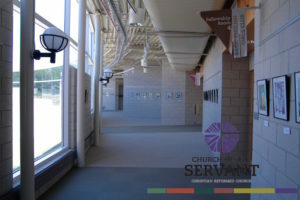 Thus, the various functional spaces of the church, such as classrooms, offices, kitchen, art and music rooms, are gathered into distinct “houses” which are linked by a fellowship arcade surrounding the “square,” or worship space. In keeping with the concept, the worship platform occupies the head of the “square,” much like a European cathedral or a New England Meetinghouse. This worship center, containing the table, font, and lectern, stands beneath a translucent skylight dome supported by the slender branches of a structural steel “tree.” The image of the tree is reiterated in the design of the pulpit furniture, as well as in the bas relief of the chapel door. As is customary for the congregation, communion is celebrated in the round, ringing the tree, under a canopy of light. Materials throughout the interior and exterior of the building are simple, common materials: exposed steel, burnished concrete block, gypsum drywall, clear birch hardwood and plywood, standard residential windows, textured plywood siding. These unassuming and unadorned materials are ‘dignified” in their employment, coming together with grace and care to glorify God and serve His people. Colors in the interior are muted, the better to support seasonal liturgical banners and paraments, as well as changing exhibits of contemporary ecclesiastical art executed by members and friends of the congregation. In contrast, colors on the exterior are striking: shades of forest green, golden brown, periwinkle blue, ash gray, and mulberry purple. These colors are derived from the foliage and wildflowers sown on the site, the bark of trees, native grasses, the sky…and are echoed in the banners lining the entry drive. In addition to helping to break down the considerable bulk of the building mass, these colors are a celebration of our diversity. They boldly declare to visitors and the community that we, the Church of the Servant, are people of a covenant promise which leads, ultimately, to joy. 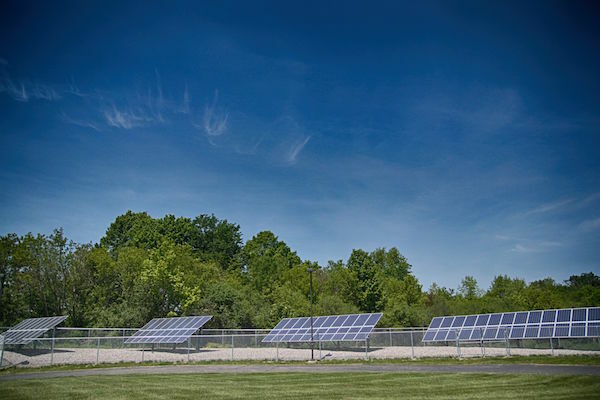 In light of the Biblical mandate to be faithful stewards of God’s earth and the financial resources he provides, the COS Facility Team has always sought to maintain and enhance the physical plant in ways that honor God’s creation and reduce operational costs. To learn more about our Stewardship Initiatives, Solar Panel Array System, and Energy Usage visit our Stewardship page. Church of the Servant CRC was formally born on Sunday, Sept. 9, 1973. Its first minister, John Vriend, was installed a year later and served COS through Pentecost 1982. A year later, on Pentecost 1983, Jack Roeda became its second pastor. 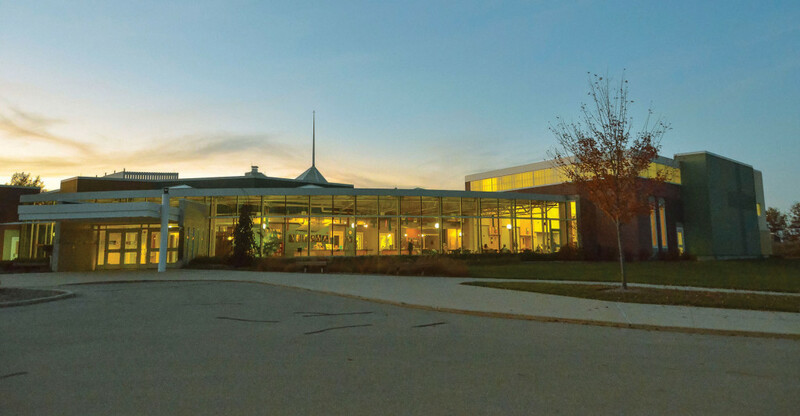 After a series of four locations–Oakhill Presbyterian Church, the basement of Creston-Mayfeild Christian School, and the gymnasiums of Mulick Park School and Seymour Christian School–the congregation decided to put down roots and construct a building. Ground Breaking at 3835 Burton SE. Mark your calendars for Monday, May 13 @ 7pm for our next gallery opening event, featuring COS artist Janis Carpenter. All proceeds of Janis’ artwork go to support Schools for Sierra Leone. The event is free with a suggested donation of $5/person. The evening will feature a conversation with the artist, live music, and a chance to peruse the gallery over appetizers and wine (available by purchase of drink ticket). Please join us for this wonderful opportunity to experience art in community! 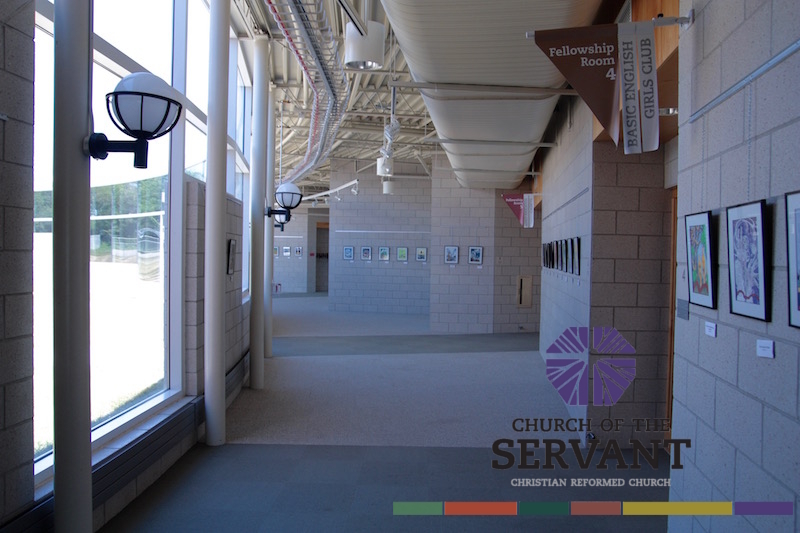 Our Sanctuary, Fellowship Rooms, Café and meeting rooms are available for rental. 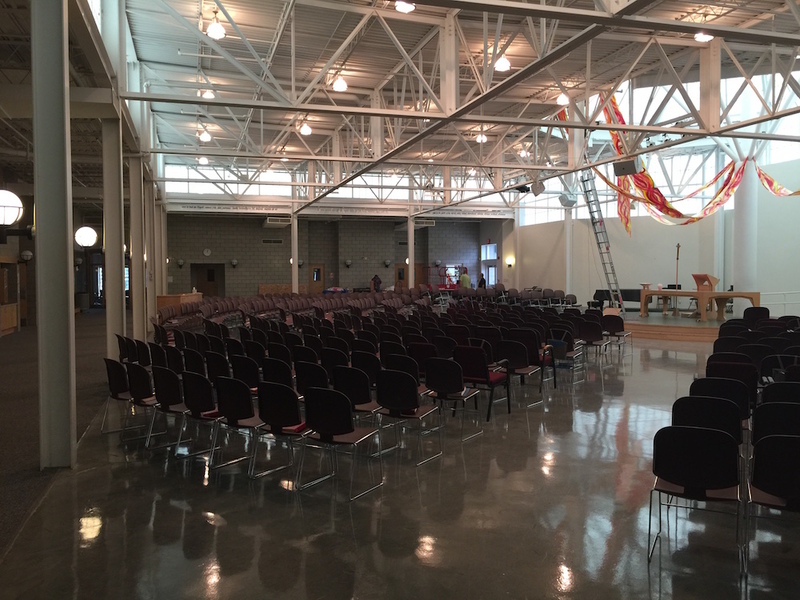 The Sanctuary can seat up to 600 people. Our Fellowship Rooms can accommodate 350 people lecture style and 250 people around tables when combined, but can also be divided into three rooms to accommodate smaller groups. The Café can seat about 70 people around tables. If you are interested in renting our facility for weddings, receptions, meetings, conferences, family reunions, art shows, etc. please email Ellen our Facility Coordinator at ellen.westrate@coscrc.org. To get a feel for our facility please see the interactive map below.